Podcast: My Brother, My Brother And Me: MBMBaM 456: Good Happy Taste!!! Here's our live show, presented before a profoundly rowdy Birmingham audience, in which sensitive issues are discussed. Drink deeply of this episode, lapping its precious nutrients out of the palm of our upturned hands. Podcast: My Brother, My Brother And Me: MBMBaM 443: Face 2 Face: Apple Time! Live from Podcon 2, it's half an episode of MBMBaM! And then half an episode of non-live MBMBaM, just to give you a well-rounded hour-long podcast listening experience! Get It! Apple Time! Podcast: My Brother, My Brother And Me: MBMBaM 436: Face 2 Face: I Had Charcuterie Today! Welp, I guess this is unofficially our second Halloween episode, because we are ding-dongs who are incapable of looking at a calendar before recording our chart-topping advice podcast. It's like having two Babadooks for the price of one! Suggested talking points: Johnny English 3 Watch, Secret Spectrum, Sentient Chairs, Zoo Busking, Nightmare Burger, Teacher Cuss Tickets, New Birthdays, Munch Squad Jr.
Podcast: My Brother, My Brother And Me: MBMBaM 415: My Very Cool Telescope! Podcast: My Brother, My Brother And Me: MBMBaM 411: Face 2 Face: Bon Voyage! Podcast: My Brother, My Brother And Me: MBMBaM 408: Come and Get It! 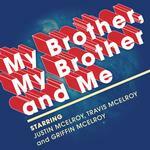 Podcast: My Brother, My Brother And Me: MBMBaM 405: Gumpy, Hey! We're breaking down all the wild twists and turns of Big Game Tony Sunday, a game we definitely had not watched at the time of this recording. Our prophecies, as per usual, ended up being eerily accurate. Suggested talking points: Super Bowl Predictions (Again), Kissing Curry, Armpit Bird, Cookie Angel Test, Wake Up to Bagels, I Like-A Do Whaaaat?!? !